While ika shiokara—squid pickled in its own digestive juices—might not be the first thing that comes to mind as something to nibble on while drinking, it is one of Japan’s revered “sake no sakana” (“snacks for sake”). This group of foods is considered optimal-flavor matches for sake, and has been united together on bar tops and dinner tables for centuries. During the Edo Period, when sake production was scaled up and no longer reserved just for ceremonial and special occasions, sake no sakana became more commonly available. 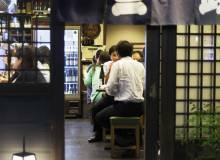 People started drinking in front of liquor stores, and enterprising proprietors started serving simple dishes to drinkers—a precursory move towards present-day izakayas, tachinomi (standing bars), kadouchi (sake shops with tasting areas), and the custom of snacking while drinking sake. Otsumami (“finger foods”) may be a more familiar term for drinking snacks in Japan, displayed on menus, packages of snacks attached to cans of booze, and grocery store labels. 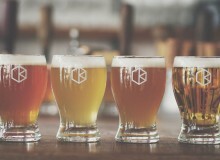 While the terms are pretty much interchangeable, they differ in regards to the type of beverage they’re paired with. 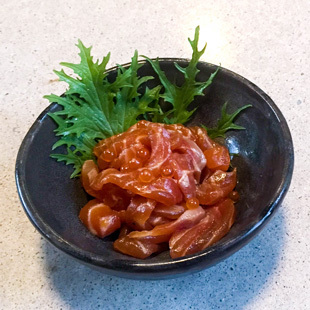 While otsumami are more general snacks—kawakimono (“dry things,” such as peanuts and rice crackers), yakitori, karaage, and edamame—that go with a range of alcohol, sakana are specific to sake. Generally, sakana are quite salty, to offset sake’s high sugar content. In the absence of a salty sakana, knowledgeable sake drinkers will often take a small lick of salt to refresh the palate. 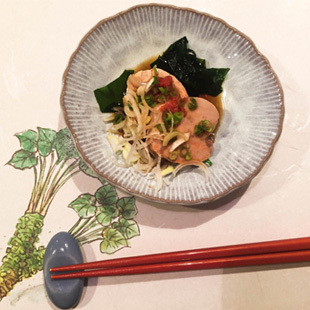 Sake has the highest content of amino acids of all alcohols, and when paired with certain dishes, intensifies the savoriness of the situation, making it all the more enjoyable. Sakana can range from pickled dishes to more elaborate concoctions, including saba heshiko nukazuke (mackerel pickled in rice bran), iburigakko (smoked pickled daikon), oden (tofu, daikon, and konyaku in dashi broth), karashi mentaiko (cod roe cured in salt and chili), negitoro (chopped raw tuna and spring onions), momijizuke (salmon and ikura cured in sweet soy sauce), tofu misozuke (tofu cured in miso, likened to a “vegan foie gras”), tatami iwashi (a dried “cracker” of baby sardines), and more modern adaptations like kasu cream cheese (cream cheese marinated in sake lees). Within this broad genre of snacks is the slimy, pungent subset of chinmi (rare taste). These “delicacies” are usually more expensive, in very small servings, and are made typically of rare and unusual ingredients like shirako (cod sperm sacs), ankimo (steamed liver of the anko fish), awabi no kimo (ground internal organs of abalone), komochi konbu (kelp sandwiched between layers of herring roe), kani miso (crab miso, where “miso” refers to the appearance of a mixture of raw crab brains and internal organs, not the soybean paste), and shuto (the entrails of bonito fermented for months then mixed with sake, honey, and mirin). “Shuto” translates to “sake thief”—a nod to a pairing so magnificent, it encourages the taking of more sake! 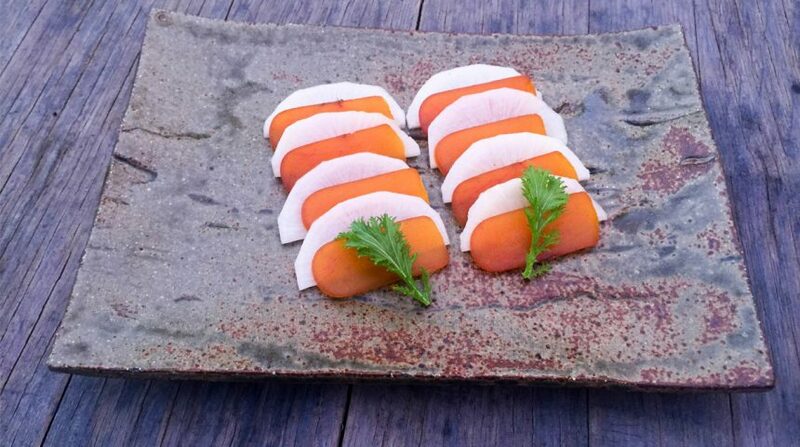 Consistent with Japan’s preoccupation with identifying the “best three” of everything, the three greatest chinmi were identified by Edo-era connoisseurs to be uni, the edible gonads of a sea urchin; karasumi, mullet roe sacs that have been salted and dried in the sunlight, similar to the bottarga of the Mediterranean; and konowata, salt-cured intestines of sea cucumbers. Conceptually a little more challenging for most than some salted peanuts or crisps, there is merit in honoring tradition to experience this attested ii kumiawase (“good pairing”)—even if only once, and even if it requires an extra tokkuri or five of sake to wash it all down.